She begins with some historical perspective on recycling, beginning with World War II scrap drives in the U.S. This was a time when patriotism and community spirit helped drive recycling to levels beyond what economic self-interest could muster. Porter then takes us on a tour of the development of the postwar throwaway culture and how it led to the landfill crisis of the 1980s and the growth of recycling in the 1990s. Covering much ground quickly, the first three chapters provide a brief and informative overview of how we got here. But this book aims for more than that. Porter strives to provide insight into the current state of affairs and how things might be improved. Where Your Recyclables Go: “Once you know the journey recyclables go on after they leave our homes,” Porter notes, “it’s easier to foresee problems of putting incorrect items in the bin, despite our good intentions and the extra bin space we might be eager to fill.” Over the last decade or so, many Americans have gained access to curbside recycling service where all recyclables are mixed together in a single bin, referred to in the industry as “single-stream” recycling. “The single-stream method of tossing all recyclables into one bin (ideally) removes all the guesswork of sorting so more people participate.” However, Porter notes, “Contamination is one of the main barriers keeping our recycling system from its full potential.” And, while single-stream recycling collection results in more volume, it also increases the residue removed at the Materials Recovery Facilities (MRFs) where recyclables are separated and baled for shipment to processors. Porter goes on to detail the processing of recycled plastics, aluminum, steel, glass, and paper. Taking Action: Finally, Porter encourages us to take action. As individuals, we are instrumental in both “harvesting” the recycled materials and in creating a demand for them. “Most systems are only as worthwhile as their inputs, and recycling is no exception. In short, we get out what we put into recycling. 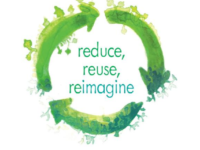 Many problems in our recycling system come from people’s misinterpretations of the process, and fortunately, this can be fixed.” She provides tips on how to become expert at what is recyclable in your area and how to inspire others to do the same. Since this book was published, Beth Porter has been interviewed for several podcasts and media stories. To learn more about her work or to find some of those interviews, visit her web page.